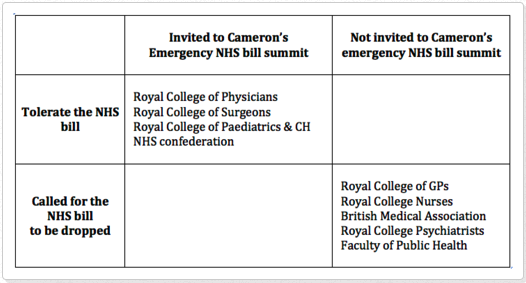 Cameron’s Emergency NHS Bill Summit… Who got an invite? Ben Goldacre would like suggestions as to how to analyse these results to see if there is any statistically significant relationship between an invite to Cameron’s Emergency NHS bill summit and attitude of the organisation to calling for the bill to be dropped. Off the top of my head, it looks like there might be a correlation. Update: Social Investigation Blogspot have published a compilation of the financial and vested interests of MPs and members of the House of Lords in private health care. Be warned the list is long. This entry was posted in Health and tagged Ben Goldacre, David Cameron, Emergency NHS bill summit by syzygysue. Bookmark the permalink.